In the command prompt execute the following command to generate Maven compatible Java project named as 'HibernateHelloWorld'. Add dependency of Hibernate core and SQLite jdbc library. Also update 'maven-compiler-plugin' so that it uses compilation level 1.5 onwards. Otherwise annotation (introduced in JDK 5) will not work. Open the directory 'HibernateHelloWorld' in command prompt and run the following maven command. 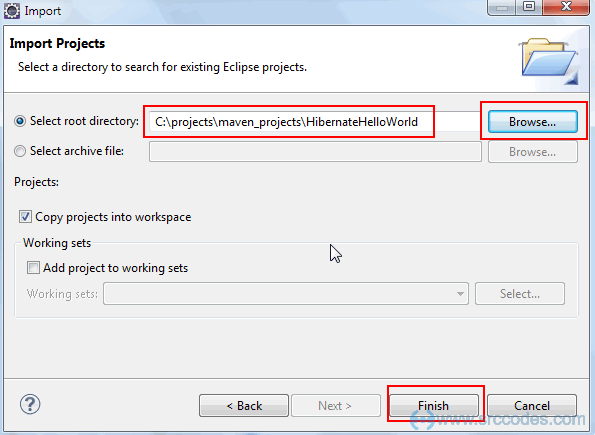 On completion of the above command, Maven Java project will be converted to a Eclipse compatible java project. Browse to the directory of the newly converted Eclipse compatible Java Project and click 'Finish' button. Right click on 'main' and select from context menu 'New' --> 'Folder'. 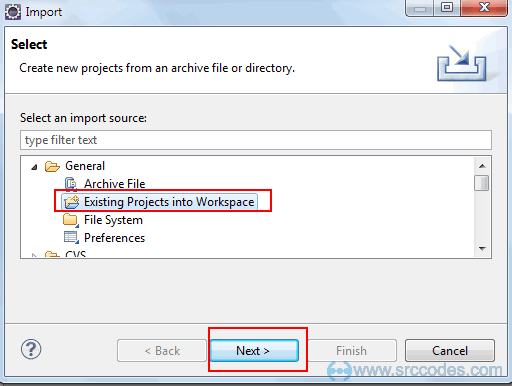 Enter 'resources' in the 'Folder name' field and click the 'Finish' button. 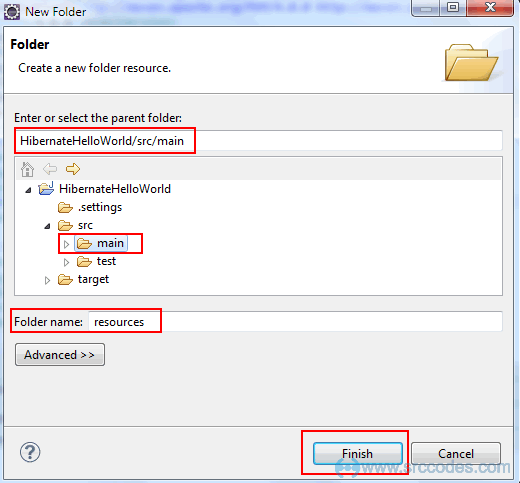 Copy the 'hibernate.cfg.xml' file in the 'resources' folder. 'mydb.db' is the SQLite database file included with the sourcecode attached in 'Download Source Code' section. You can create db file of your own using 'SQLite Manager - Firefox addon' UI. But copy that file inside 'HibernateHelloWorld' project directory directly. I have set the property 'hibernate.hbm2ddl.auto' to 'update' so that when you will execute the code it will create the database tables of it's own based on the entity class 'com.srccodes.example.hibernate.Contact') we have written and referenced in this configuration file. 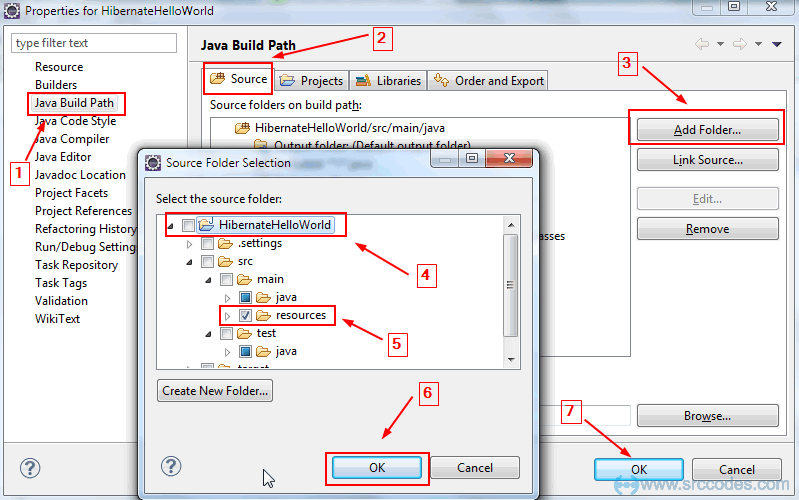 Right click on 'HibernateHelloWorld' project and select from context menu 'Properties' --> 'Java Build Path'. 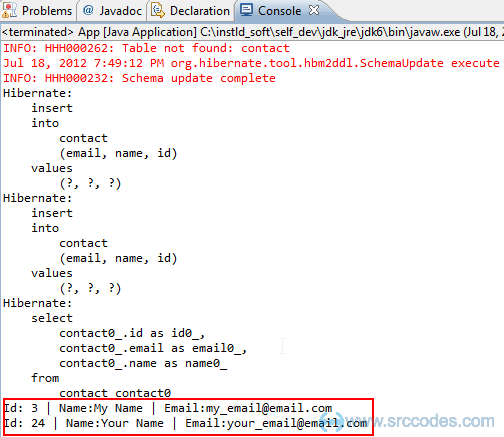 Copy from attached source code or download SQLiteDialect and add under package 'org.hibernate.dialect' in your project. dialect is used to help hibernate framework to create underlying database specific SQL query. Create a class 'Contact' under the package 'com.srccodes.example.hibernate' and copy the following content. * The persistent class for the contact database table. 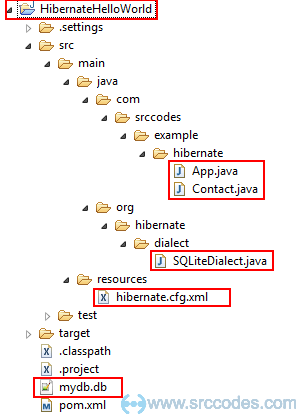 As we have set 'hibernate.hbm2ddl.auto' property in 'hibernate.cfg.xml' file, hibernate will generate the schema for the first time and for every change of the schema based on the annotation we write in the 'Contact' class. Annotation '@Table(name = "contact")' will create a table named as'contact' in the SQLite database. As 'id' field of 'Contact' class is annotated as '@Id' so 'id' will be the primary key for the generated table 'contact'. 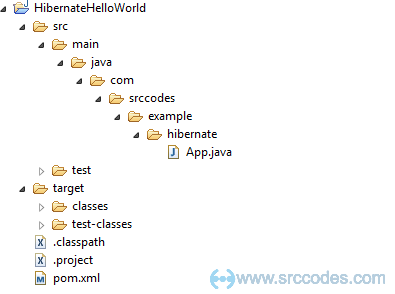 Copy the following code to 'App' class of package 'com.srccodes.example.hibernate'. Right click on 'App.java' and select from context menu 'Run As' --> 'Java Application'. Now code will save two records in the database and fetch them to print in the console as well.